The SATA-HC IP block simplifies the integration of high capacity SSDs utilizing SATA I/II/III at 1.5/3/6Gbit/s data rates using Xilinx FPGAs. Combined low-latency and high throughput is achieved by accessing the SSD directly from FPGA logic with no external circuitry. 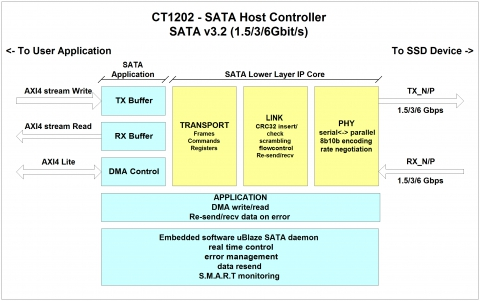 The lower protocol layers Phy/Link/Transport are implemented in an all-RTL solution, which minimizes access time by providing the shortest possible path between SSD and application. Integrated solution provides highest possible Megabytes per second. Sustained throughput enables consistent and predictable high performance.